This is the first exercise in which I need to think a scene through, draw and film. The scenario is given, which helps a lot so now I can focus on how I can bring the scenario across as well as possible. When reading I first tried to think of the circumstances in which the subject finds itself in. He or she is a secret alcoholic who discovers a bottle of drink and pours herself a drink. There's a lot of secrecy and tension in the scene. The fear of being caught, the boredom the subject finds itself in to have an excuse to look for a drink again. Feeling caught in one's own environment, etc. I decided to shoot the sequence in the dark. My house is obviously a place where kids live in, and I thought it would be nice to add an extra sense of secrecy to suggest that everybody else is sleeping. In the notes below the drafts you can read the details about how I wanted to focus in the shot, but I'll write it down seperately as well. This frame is all about showing that the person has found herself in a situation when there's nobody to check on her. Empty should not be taken literally. I stress the emptiness and isolation by letting the person sit in a dark room with only the table lit but still looking around. The use of wide angle is best for this, to show the space and emptiness. Trying to reflect an inner state of mind is hard, but I did that by slowing down the pace and just showing the empty table, up till the moment of which the viewer might not be interested anymore. 3. You notice a bottle. 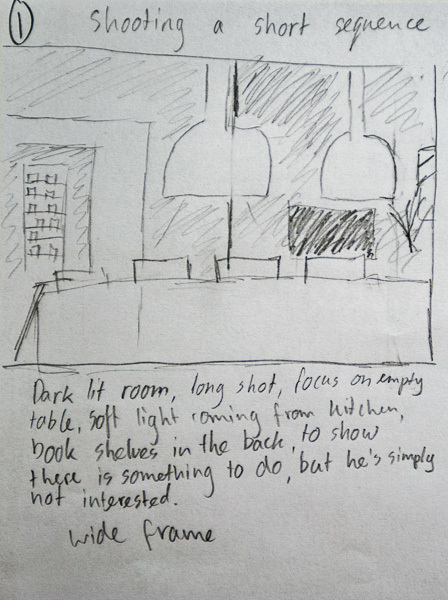 The noticing happens through lighting the place where the bottle is, in the cupboard in the kitchen. The bottle itself is not visible yet, but I wanted to show how the person might all of a sudden realize that there might be something in there. 4. You hold the bottle and unscrew the lid. The walk to the kitchen and the bottle is a long one. I assume that the person is a bit hesitative. Than when she takes out the box, it's obvious that there are a lot of bottles. Here I zoom in on the box and then go down so that it's obvious that the person takes the bottle out. I wait with letting the person unscrew the lid untill she has heard the sound. 5. Something attracts your attention, you look around. Since the person is in the kitchen cupboard, I thought it would be more interesting to let her walk back to the hallway and look around to see if somebody is coming. We're back to wide angle shots, and this time the pace is up, just to convey the fact that the person feels caught and needs to act quickly. The places where the person looks is empty, so now the pace slows down again, although she hurries back to the bottle and takes it out. 7. You look back at the bottle and pour yourself a drink. Back in the cupboard, shots in close up to the bottle and glass, pour a drink and get the glass. The camera stays in the same position and the glass gets taken out of the frame. The result is a bit different then the storyboard. 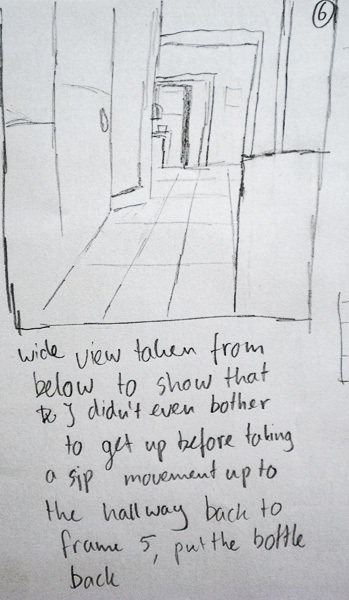 First of all, because it was dark, I realized it would be better for the person to look up the stairs instead of the corridor, because it was better lit. Secondly, I couldn't get the lid of the first bottle, so there's a bit of a fluke in the movie. The quality is really awful with lots of noise, but I'm still waiting to get my camera and this was filmed on an ipod 5. I think the piece can be improved by being more aware of the speed of how things are happening and by building up more tension in the shots. I guess this can be done by bringing more diversity in fast moving and slow moving shots.